See the old man in the background? This is right before the end, before his life flashes before his eyes. He has a lot of memories that are unlike mine, such as marrying and raising kids. And throwing eggs and stink bombs. Well, I think I got the better deal… but actually I hope it is a bit early to sum up yet. 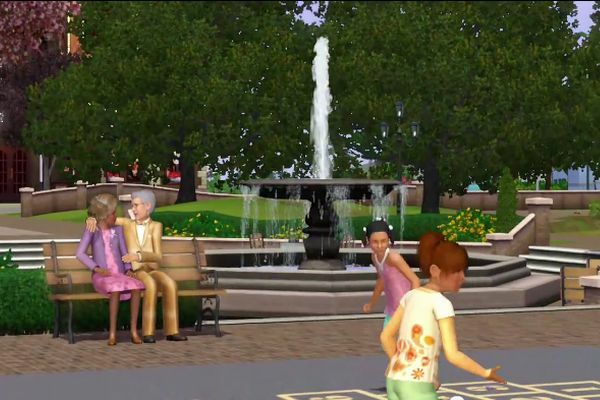 Some time ago I wrote about the YouTube trailer for The Sims 3 Generations. The part that really got to me was the ending, where the camera zooms in on the old man in the park and we see his life pass before his eyes in a jumble, and then stop at one particular moment of his life. I am in no hurry at all to test the whole “life flashes before your eyes” part, I assure you. But if that movie had been about me, what would those pictures have been and what would that final picture be? I believe that unlike him, my pictures would mostly have been of me alone or more rarely with groups of people, although Supergirl (or Superwoman as she wanted me to write) would probably also have featured in some of them, and probably a couple other girls. But mostly me and a computer, or me and a book, I guess. And I think the last one might have been of me in my grandfather’s rocking chair the day I read the tract by Elias Aslaksen about the way to react, and realized that I had free will, regardless of what people did around me. But I don’t know for sure, and I am in no hurry to test it. If we were sims – I would have wanted to be played by someone like me. That may be a very small thing indeed to boast of in recounting my life, but I generally treat my sims the way I would have wanted to be treated if someone up there played me. Well, I guess I might have wanted a little more freedom… but my sims get to play if their fun motive is low, eat if they are hungry (and frequently their favorite food, at that) while at the same time I nudge them to work toward their long-term goals when the opportunity exists. They live long, happy lives and generally achieve permaplat (in Sims 2), roughly corresponding to an unshakable mind in this world, well before they pass on. There is no mention in the Holy Scriptures of treating our Sims the way we want to be treated, so I don’t know how much it matters. But I think it does, if we play games like that at all. And they are indeed a way to wisdom, if you don’t lose yourself in them. In the higher speed of time in these simpler worlds, the consequences of choices play out much faster than in our world. And some of us also consider the possibility that there are levels of reality higher than this one, higher dimensions not made of the same elements, from which greater minds than ours may watch us but we may not watch them. But it is probably not quite the same. There are scientists who say that this world, which we consider 3-dimensional, may actually be a hologram. Others again say that it seems not to be divisible endlessly, but that there are minimum measures of everything, such as the Planck length and perhaps even a Planck time, similar to the clock ticks of a computer… But then, each era has cast the universe in the perceptions of its own age. Perhaps if we begin to understand the universe, it will change again … like a new expansion … or perhaps it is our minds that need to expand? This entry was posted in games, philosophy and tagged Sims 2, Sims 3 by itlandm. Bookmark the permalink.